Technical problems can impact heavily upon the smooth running of your classes, causing stress and frustration. However, there are a few quick fixes that will often resolve the vast majority of issues. Occasionally, certain elements of the TTRS program may appear to be missing or not working as you would expect. For example, the "Show Word" icon may not be visible during the dictation modules. An easy solution is to press the Ctrl + R keys to reload the browser page. However, be warned that this will take the user back to the start of their current module. Although the TTRS program works with all the main web browsers, if you are having problems, a speedy solution can be to try a different browser. Clearing the cache can also resolve a variety of different issues. 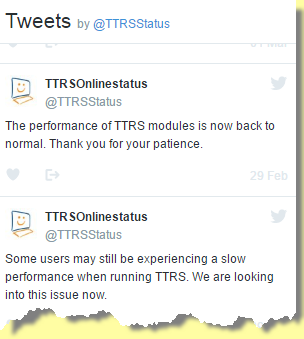 The TTRS login screen sits alongside a live Twitter feed which will keep you informed of any software updates, scheduled server maintenance periods or other technical issues. If for any reason you wish to move a student on to the next module without completing the previous one, perhaps as a result of a technical issue, normally this action will be blocked. However, by accessing Users from your teacher console, you can set an individual’s Level setting to Unlock all levels. This means the student now has free movement to all modules. It is recommended the previous setting be restored as soon as the situation no longer requires unlimited access. If all your attempts to resolve a technical issue fail, don’t forget that TTRS technical support team are on hand to help.